See listed price for low range estimate. You will NOT be charged for the item(s) until they are confirmed by your Account Manager. Hand-made in Canada by our in-house artisan. 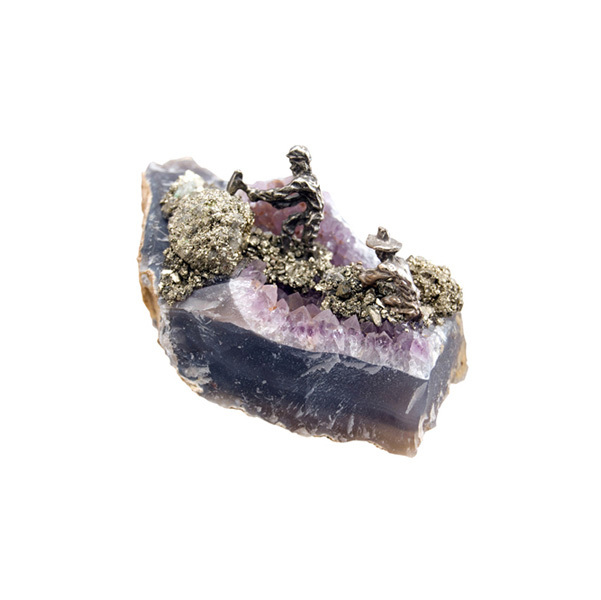 Each piece is unique and designed to complement the natural contours and beauty of the amethyst cluster. 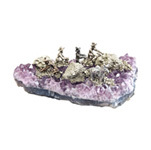 These mining scenes on amethyst make great gifts and conversation pieces for men and women alike. Canada's mining history is a story of discovery, dreams and adventure. 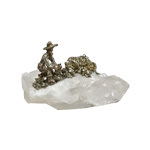 Surviving harsh conditions, prospectors were true Canadian pioneers. they weathered the elements in search of precious resources. Their determination and courage led them to new frontiers. Communities all across the Canadian landscape have been built upon mining and exploration activities. This history is woven into the fabric of our nation. 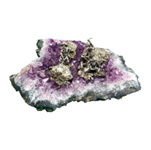 Miners on amethyst are priced based on both the weight of the amethyst cluster and the number of miners. 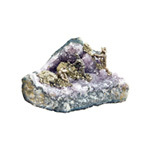 This item will be a small - medium cluster with 1 - 3 miners. 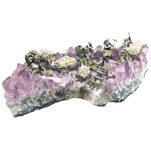 "I came across an artist who was making pewter mining figurines. 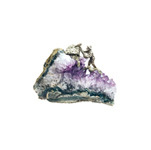 I bought some up and placed these little miners in agate geodes and on amethyst, adding just a hint of pyrite for the look and feel of gold. These celebrated a part of our history, and just like our history they are timeless, making an attractive souvenir and gift. 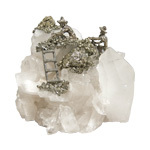 We now have a full-time Artisan to create these one of a kind pieces."